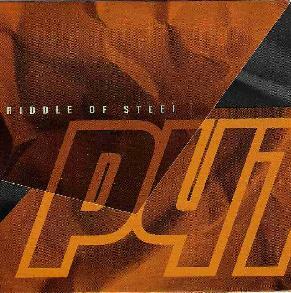 Riddle Of Steel - "Python"
Riddle Of Steel are a St. Louis based trio that play a hard driving, intelligent brand of pop-rock with a punky attitude and a prog rockers eye toward turn-on-a-dime thematic and rhythmic shifts. The band consists of Andrew Elstner on guitar and vocals, Jimmy Vavak on bass and vocals, and Dave Turncrantz on drums. Imagine a cross between MX-80 Sound and Joy Division and you might get something like Riddle Of Steel. Early XTC comes to mind as well, though there's a more potent razor sharp edge to the Riddle Of Steel sound. Vavak's low end pounding bass and Turncrantz's incessant but sophisticated drum patterns anchor the bands sound, while Elstner's guitar leads with an imaginative combination of thrash and melodic constructions. Among my favorite tracks is "A Dime For The Curse Jar", a blazing thrasher of a tune, but with a clear focus on instrumental structure and development. These guys can do a lot in under 4 minutes. "The Gaping Jaw" rocks as hard as anything in the set, but goes the furthest in revealing the bands progressive rock influences. The spirit of King Crimson looms over the proceedings, and while that doesn't mean Riddle Of Steel sound like King Crimson, "Time For The Truth" and "Revenge Of R.O.S." are highlight tracks that come close, and some of the guitar patterns on "Double-Fister" have a decidedly Frippoid ring to the them. In summary, if you want to rock HARD, but are a discerning listener who appreciates a thoughtful and well executed approach to songwriter and playing, then you'll more than likely find much to enjoy in Riddle Of Steel's music. For more information you can visit the Riddle Of Steel web site at: http://www.riddleofsteel.org. Python is distributed by Ascetic Records. You can visit their web site at: http://www.asceticrecords.com.